Wilson Wyatt, Jr. is a published writer and photographer. He is best known regionally for his supportive roles within the writers’ community on the Delmarva Peninsula. He is active in the Eastern Shore Writers Association, where he was a past president, and he is a former coordinator of ESWA’s Bay to Ocean Writers Conference. He is also a founder of The Delmarva Review, published by ESWA as a literary journal open to the new work of all writers. The Review is now in its fifth printing. Wilson’s photography has been exhibited in galleries regionally and in Phoenix, Arizona. He writes a blog: Writing & Photography – the Art of Words and Images, at http://wilsonwyattjr.com. Jan: Thank you for taking the time from your busy schedule to talk about your work as a writer, publisher and photographer. As one of the founders of The Delmarva Review, your influence is well established among Maryland writers. What was the impetus to begin a new literary journal in Maryland five years ago? Wilson: The Eastern Shore Writers Association wanted to produce a legitimate literary journal that would showcase the best writing of authors from the region and beyond. I use the word “beyond,” because the Review is open to all writers, everywhere, which assures its standing among other fine literary journals. About 70 percent of the writers are from the greater region. In all, over five years, we have published new prose and poetry from 116 authors, from 21 states, the District of Columbia, and seven foreign countries. Submissions are competitive, as expected for a journal with high quality standards. The result is that publication represents a literary achievement for the selected writers. That is a significant opportunity. The published prose and poetry of 24 authors have been nominated for the prestigious Pushcart Prize. Another purpose of the Review is to inspire inquisitive writers. Each piece our editors select can become an excellent example of writing to study for its craft and how it achieves “memorability” with readers. Jan: What was your involvement in the start-up process and what is your role now? Wilson: I am humbled by my peers, and I humorously refer to myself as an “instigator” and an organizer. I’m always amazed at the incredible talent of so many people I meet in the writing community. 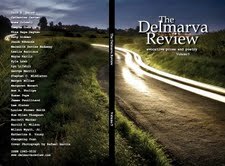 When you look at those who have been active volunteers with The Delmarva Review, it is obvious that the publication’s success is due to their talents…as poets, writers, critics, designers, and editors. My role has been to engage them in this effort, to develop the Review into a quality publication of literary writing. My current role is executive editor, but the editorial board members share equally in the work and success. We’re all volunteers. We do what we do to encourage other writers and contribute to the literary community. That’s important. Jan: What kinds of work are you looking for when you, and the talented Delmarva staff of volunteers, sift though the stories, poems, and essays that are submitted? Wilson: We encourage great story-telling and moving poetry. Our standards are for “memorable” prose and poetry that exhibit skillful expression. Each submission is read by more than one reader, which minimizes the subjective nature of selection. Of course, we’re limited in how much good work we can publish in a single issue. Our best advice is for writers to read selections from past issues before submitting. 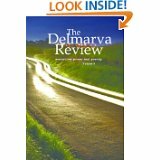 The Delmarva Review is available to order from the website, www.delmarvareview.com, or in a digital Kindle edition from Amazon. Jan: You’ve written and given talks about the state of publishing today. In your opinion, what is ‘honest and true’ and essential to know about publishing today? Wilson: It’s a great time to be a writer. Thanks to digital technology there are more authors, more publication services, and more books being published than ever before. “Self-publishing” is now an accepted practice, even for established authors, and it competes head-to-head with traditional publishing. This is a permanent sea change. That’s the good news. Jan: What is really happening in the ‘publishing’ and ‘self-publishing’ industries? Can you talk about it from a writer’s perspective? Wilson: What writers need to know is that the quality of their work must appeal to a much more competitive market of readers. It has to be good, in the eyes of readers. Ultimately, the best test for a book’s success is one word, “sales.” Regardless of genre, the volume of sales will determine the success of a book. You can win contests, get excellent reviews, use all kinds of promotional devices, and advertise your book, but the common denominator of success will always be sales, and repeat sales, from readers. A good book will help sell the next one. Building a following of readers is the author’s gold mine. With few exceptions, success is built upon the substance of the book. I emphasize this because in this new world when anyone can become a published author overnight, many writers may think their work can somehow achieve success merely by being published. They can become disillusioned quickly when there are no readers and sales. There are reasons for this, but the biggest one is that the substance and quality of the work does not meet the reader’s expectations. Since the marketplace is now being flooded with new books, especially eBooks, the quality of the work must stand out. Quality writing is more important than ever before, in every genre. Jan: What are the benefits and problems associated with social media for writers? Wilson: The greatest benefit of social media is that it can alert a huge worldwide audience of your work, if done properly. That’s amazing! The biggest problem, however, is that most people promote their work without regard to the original purpose of the social medium. They treat it like typical advertising media, and it’s not. It’s “social,” not “commercial.” The misuse of social media is far more prevalent than its accepted use and purpose. The leviathan of social media is Facebook. However, if one thinks they can simply post the title of their book on Facebook, telling a billion people to buy it, they will be in for a great disappointment. People joined to connect with other people, for many reasons, but not to be sold anything. Anyone wishing to use social media (Facebook, Twitter, YouTube, Google+, LinkedIn, Pinterest, blogs, etc.) should take the time to use or study each one. They are all different, and new ones will develop. Understand them, first. Like in any marketing activity, a little homework goes a long way. Knowing the medium is essential to using it successfully. Personally, I think social media can be a powerful, complimentary piece of a much greater marketing effort, especially for books. If you accept my premise that the greatest promoter of a book is the reader, then a good marketing effort should begin with knowing why a reader would want your book. Identify your reader. Jan: What do you see as the changing role of agents? Will agents be needed in the future? Wilson: While most agents are still wedded to traditional publishing, that is bound to change with the marketplace. A good agent can be helpful with legal issues involving contracts and future rights. Some will be a helpful bridge to many small publishers, or to the film and broadcast industries. An agent can become a good “manager” for a book project.As long as they know the marketplace, it’s likely they will have a better future than the big publishers. The agent’s role is still evolving. Jan: What factors are helping to establish the legitimacy of self-publishing? Wilson: Technology and numbers. Publishing is a business. Digital publishing, especially POD (print-on-demand), has totally changed the economics of publishing, giving authors the opportunity for more lucrative sales, with little risk. Simultaneously, the Internet is now providing the means for powerful mass marketing tools worldwide, thanks in large part to Amazon and Google. By example, in 2012, the first multi-million-dollar contract with a major publisher was turned down by a popular author who decided to self-publish his best-selling novels. Add to that the advent of eBooks and digital readers, and suddenly self-publishing is far more acceptable and growing rapidly. Ultimately, the reader will decide the legitimacy of authors through sales volume. The gatekeeper will be the marketplace. The former gatekeeper role of traditional publishers is diminishing. However, as suggested earlier in this interview, the reader will become more and more discerning and selective, as more and more books flood the market. There will always be a market for good writing. 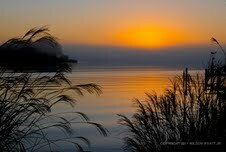 Jan: Congratulations on your beautiful photograph, “Sunrise at Thomas Point Lighthouse,” winner of Nikon’s Mentor Series “Best of Maryland” photography competition. Your award winning photographs are among the most recognized and admired photographs of Maryland landmarks around the Chesapeake Bay region. What advice can you offer to photographers seeking to “click” the right moment? Wilson: Beauty attracts the eyes of everyone. The Chesapeake Bay region, from the Bay to the ocean, is a constantly changing landscape of natural beauty, from sunrise to sunset. No wonder it attracts so many photographers and artists. Many are outstanding and inspiring. I am constantly studying and learning photography. Like with other artistic endeavors, including writing, the more we do it, the better we are at our craft. A big lesson I’ve learned in photography is to take lots of images and to be fearless. Light is always changing, even on a still landscape. I am not satisfied with a single shot. Catch the changing light with many images. I tell myself, I may never be at this spot or see this scene again. In my photo that won the Mentor Series Best of Maryland competition, I joined a number of experienced photographers shooting Thomas Point Lighthouse. We were on a moving boat, just before sunrise. Everyone wanted to catch the sunrise. Out of the corner of my eye, I noticed a cruise ship approaching on the right and a tanker on the left. The beacon of the lighthouse was revolving, and the sun started peaking above the lighthouse. Each was in motion. I kept shooting until all of these elements came together, filling my lens. Out of many shots, there were only two that captured the ultimate scene. I wanted more than just another sunrise over the lighthouse. Jan: Tell me about your favorite photo adventure as you’ve participated in the Mentor Series Worldwide Photo Treks sponsored by Nikon and Popular Photography magazine. What did you photograph? Wilson: I learn a great deal from mentors, and I try to mentor others, as well. The “Mentor Series,” guided by at least two Nikon professionals, is one of several great photography programs. 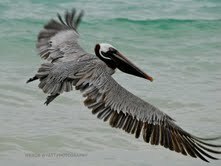 I’ve also joined other photography treks in Yosemite, Alaska, and the Galapagos Islands. While constantly learning on treks with other experienced photographers, the best ones are hard work. 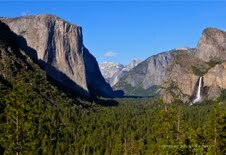 Yosemite involved eight miles of hiking every day, on difficult terrain, but it was worth it. 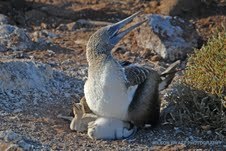 My favorite was a week in the Galapagos Islands several years ago. That was an opportunity of a lifetime. I’d like to repeat it. Knowledge and practice improves us over time. Jan: If a great picture tells a story, which of yours provides the richest narrative? 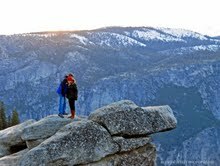 Wilson: I took a photo of a young couple in Yosemite who had ventured “off trail,” standing on the edge of a granite boulder hanging 3,000 feet above Yosemite Valley. It was a precarious, dangerous scene. The image showed the young man looking in one direction, over the edge, while the young woman was looking back toward the trail, as if wanting to return to safe ground. It showed danger, fearlessness, and fear, simultaneously…from two different perspectives. I actually felt dizzy taking the photo. A writer could create an intriguing story from the image, but the photo told its own. 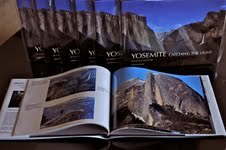 Jan: Your book, “Yosemite: Catching the Light,” is a collection of 75 color images taken in Yosemite Valley and wilderness in early June 2011. You’ve dedicated the book to your son, Wilson Wyatt III, a professional photographer in Phoenix, Arizona. Published as a collector’s limited edition, you offered it to those who have an interest in fine art, photography and nature. What are you working on now? Wilson: I’m completing a new limited edition book, “Chesapeake Views, Catching the light,” which will be published this spring. 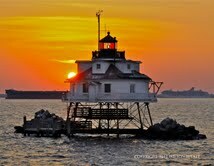 It is a collection of photographic images taken around the Chesapeake region, on land and water. In addition to “catching the light” and creating a feel for the region, I am including photographic data on how some of the images were taken. This may appeal to many enthusiasts who want to enjoy photography as a hobby. I always want to know how a photographer takes an interesting shot. Jan: Thank you for taking the time for this interview, Wilson. I have admired your photography and appreciate the fact that you are a legend among photographers and writers here in Maryland. What advice would you share with aspiring writers and photographers about nurturing the creative process? Wilson: For me, life is a journey, not a destination. Even in silence, the muse is always with us. All we need to do is take the time to listen carefully, look around us with an inquisitive eye, absorb the beauty, and put our imagery on paper. Learn as much as we can from others, with humility, but always be willing to offer a helping hand. Creativity and inspiration are not passive endeavors. This entry was posted by Jan Bowman on Tuesday, March 5, 2013.